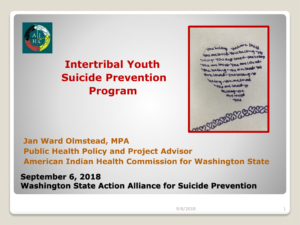 WeRNative Blog for National Suicide Prevention Week. 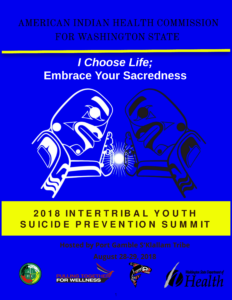 We just had the successful completion of the 2018 Intertribal Youth Suicide Prevention Summit at Port Gamble S’Klallam Tribe! 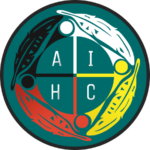 Primary funding for this project is provided by the Washington State Department of Health. 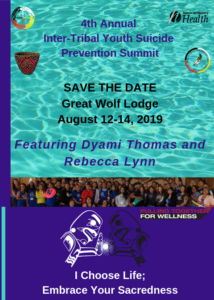 However, the Youth Suicide Prevention Summit 2018 could not have happened without the support and contributions of the speakers, attendees, sponsors, tribes, organizations, volunteers and drawing donors. Thank you! Some warning signs may help you determine if a loved one is at risk for suicide, especially if the behavior is new, has increased, or seems related to a painful event, loss, or change. If you or someone you know exhibits any of these, seek help by calling the Lifeline 1-800-273-8255. OSPI provides resources and support through the School Safety Center to help inform Educational Service Districts, School Districts, and Schools in the development of Suicide Prevention Plans. Beginning July 1, 2017, healthcare professionals required to complete a suicide prevention training must select a course from the 2017 Model List. See the training requirements for health professional time and content requirements.